Welcome to the Deep Blue Sea Training image galleries section. 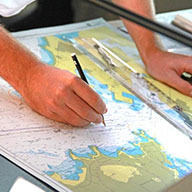 Here you will find a range of images from the classroom to the open ocean and everything in between. Check out our great training facilities and see our happy students in action. Gallery 1 features mutiple images across a broad range of courses and training events. 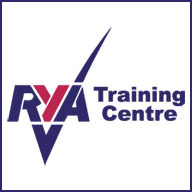 Many RYA courses are included, from Yachtmaster courses to VHF courses to Day Skipper training and much more. 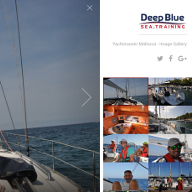 Check out images of our classrooms and see our students as they work on-board our training yachts. See the happy faces on show as the students pass their courses and hear what they have to say via our audio testimonials. Gallery 2 features many images from our range of courses and a few other pics for your enjoyment. 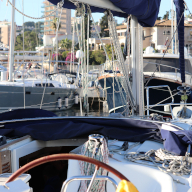 At Deep Blue Sea Training in Majorca, we run the full scope of RYA courses leading to the Yachtmaster qualification including the Yachtmaster Theory Workshop, the Yachtmaster / Coastal Skipper Course and the RYA Yachtmaster™ Offshore Certificate of Competence courses. Gallery 3 features a range of images including some of our new training fleet for 2019 in addition to pics of sea survival training, first aid training and our students out on the water. 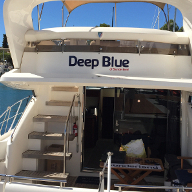 Our motor yacht, 'Deep Blue', is berthed at Calanova and is a Fairline Phantom 46 boasting powerful twin Volvo Penta turbocharged diesel engines driving shafts/props - quiet, clean and economical by yachting standards, air-conditioned and with a great layout and equipment at both lower and flybridge helms including radar. An exceptionally spacious flybridge cruiser. She has one double, one twin cabin and one bunk. 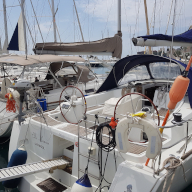 Ellie Lauren is an ultra-modern and well-equipped Beneteau Oceanis 43 which is an excellent, spacious and comfortable sailing yacht. She is a fantastic boat with a very safe and comfortable design and is perfect for ocean sailing and cruising. She is easy to use and has good maneuverability.